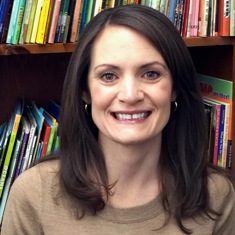 Melanie Swider currently teaches fifth grade in Simsbury, Connecticut. Previously, she was a fourth-grade teacher and a literacy coach in her school district before returning to the classroom. She loves sharing her passion for literacy with colleagues and students. 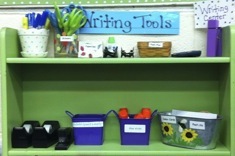 Melanie also blogs with Melanie Meehan at Two Reflective Teachers. Many teachers have a love/hate relationship with sticky notes in their classrooms. They’re a wonderful tool, but it can feel like reading workshops are overrun with them. Melanie Swider coaches a teacher new to second grade with a series of collaborative lessons on using sticky notes purposefully. Melanie Swider finds that her first task in moving from teaching to a coaching role at her school is to think through how she will organize and share resources with teachers. Scratch that—her very first task is convincing her principal that a large room needs to be set aside for professional development resources. 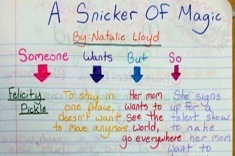 Melanie Swider finds sketchbooks are a nifty tool for creating sample anchor charts as well as conferring with students and teachers. Melanie Swider believes access to supplies is crucial for student independence, and she even has students in charge of monitoring and replenishing materials. 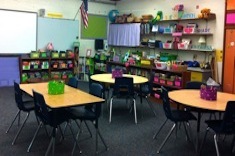 This is the final installment in Melanie's classroom environment series. 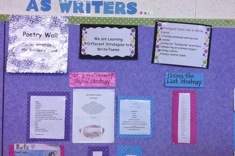 Melanie Swider shares her favorite bulletin boards, another installment in her classroom design series. 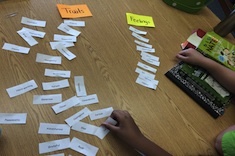 Melanie Swider enhances read alouds and the entire reading workshop with creative uses for reading notebooks. 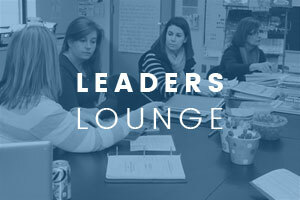 Melanie Swider shares how classroom design is linked to community building.